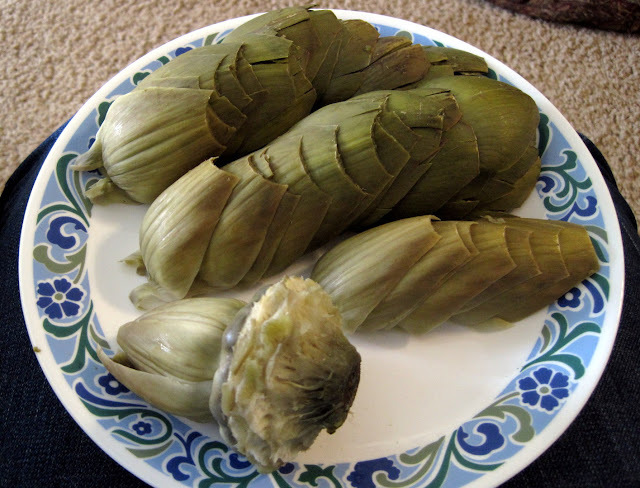 When I first tried artichoke (hearts) long long ago, I was unimpressed. They came from a jar and were placed on a salad. I found them rather oily and flavorless. And so, the decades flew by without me ever trying another one until I was in my late 30's. 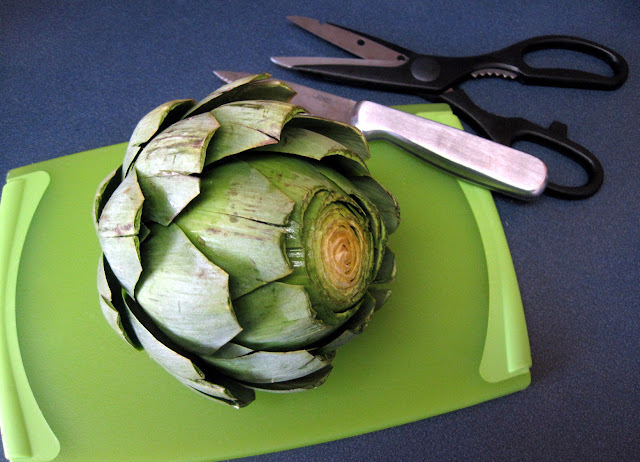 I was blogging and losing weight and trying new things, so I was determined to learn how to cook an artichoke myself. At least then I could say I'd tried it, right? I had to look in a few cookbooks to figure out what to do with this big pokey thing, but once I figured it out, it was easy! Here's your lesson, in just a few easy steps: how to cook and eat an artichoke. Rinse it under cold running water and shake off the excess. Use a kitchen knife to cut off the stem. 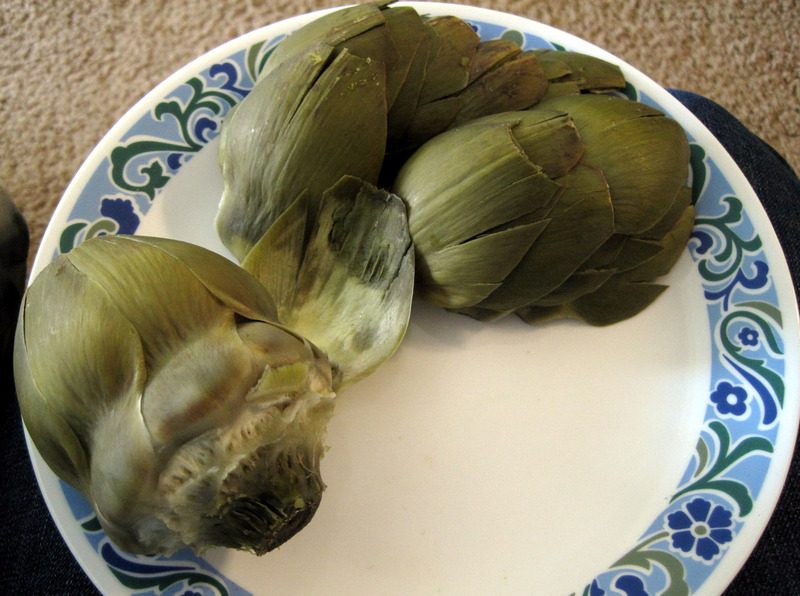 You can save and steam it along with your artichoke; it is very good peeled. Mine didn't have a long stem so I tossed it. Then use your knife to cut off about an inch off the top. Take some scissors or kitchen shears and cut off the tip of each leaf. They are kind of pointy on the end, so this will keep you from getting poked while you cook and eat it. Plus it just looks prettier trimmed. Now put a few inches of water in the bottom of a big pot and bring it to a boil. You can add things to the water to flavor the artichoke, like lemon, herbs, a bay leaf, or garlic, but I usually don't bother. If you have a steamer basket, use it. You can also set a metal colander over the pot instead. 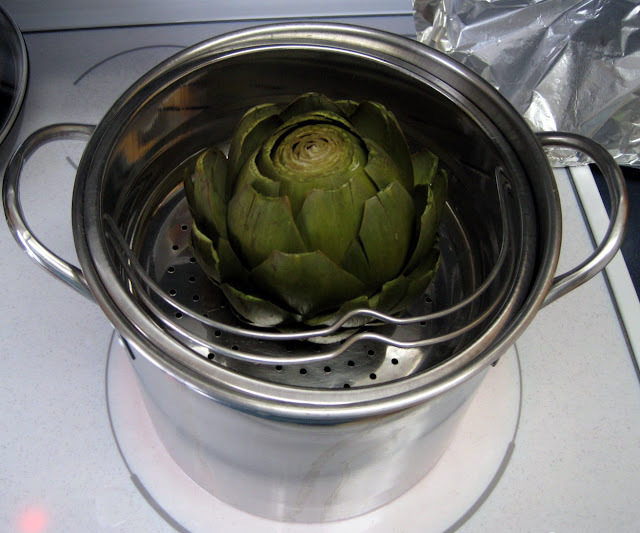 Put the artichoke in the basket or colander and cover it loosely with a lid or aluminum foil. Steam it for about 30 minutes. Smaller artichokes might take 20-25 minutes while giant ones might take 40. You can tell it is done by turning it over and poking the center base with a fork; it should be tender, and the leaves should pull off very easily without effort. Undercooked artichoke is hard and not good. Remove the steamed artichoke to a plate and cool slightly so you don't burn your fingers eating it. Enjoying an artichoke is a ritual and takes time, but is so relaxing and enjoyable to me. If you are working on eating slowly, an artichoke is your best friend. Once it is cool enough to handle, turn it over and start peeling off the leaves one at a time. There will be a little lump of tender flesh at the base of each leaf, see? You scrape that flesh off with your teeth. Do not eat the leaves! Yuck! They are tough and fibrous. Just place each leaf between your front teeth, bite down, and pull the leaf out. What you scrape off is the tender flesh. At first, you will wonder why you bothered. The outer, bottom leaves are the least tasty with the least amount of edible flesh to scrape off. But as you work your way through the artichoke, the leaves get more and more tender, with more yummy flesh to eat. See the leaf with the flesh scraped off? Do not eat the fuzz! Yuck! Gross! That is called the "choke" and believe me, if you try to eat it you will know why. Instead, now is a good time to empty all those leaves off your plate, and use a spoon or small knife to scrape out all the fuzz, leaving behind the crown jewel of artichokes: the heart. Doesn't look like much, but this is what you worked for! This is the best part. Slice it up and eat it with a fork, dipping it in butter if you like. It is so delicious and tender and to me tastes *nothing* like those marinated ones in a jar. This is a real, yummy vegetable, slightly reminiscent of tender, fresh sweet corn. It has a flavor all its own. You really have to try it. 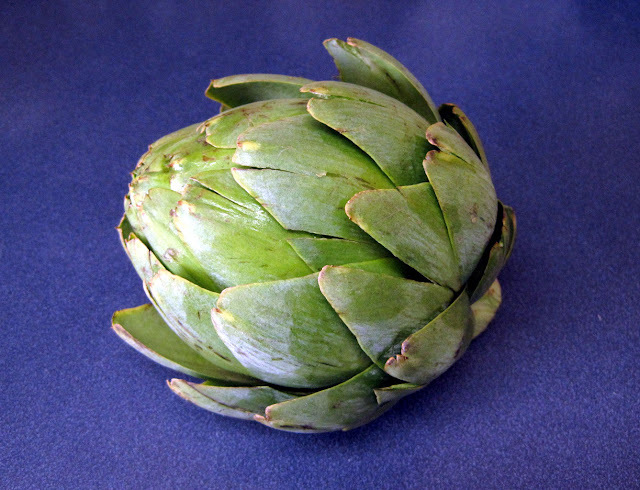 One large artichoke (edible parts) has only 60 calories and gives you 4 g protein, 13 g carbs, 6 g fiber, no fat, 20% RDA of vitamin C, 8% RDA of iron, and 6% RDA of calcium. It is very much worth the effort and feels like a special indulgence every time I have one. If you haven't tried one, I hope this inspires you. Eat your veggies! Eating every 2-3 hours does tend to help stabilize blood sugar. I think doing South Beach on a schedule with some guidelines for the snacks is a good idea. My eating schedule is, loosely, 8am/noon/6pm for meals, and 10am/3pm/8:30pm for snacks. A snack, for me, is about 100 calories, low in carbs, high in protein with some fat. So 100 calories of nuts or broccoli and hummus or berries and Greek yogurt are good ideas. Let me know what you end up doing! I LOVE artichokes! I cook them in the microwave. Put 1/3-1/2 cup of water in the bottom of a bowl. I use a soup bowl, one that's deeper than it is wide, and the size where the choke fits it well. Put the artichoke in the bowl upside down, so the stem is up (I cut off the stem also). Cover with wax paper and microwave for 3-5 minutes. You know it's done when the flesh is soft enough to pull off with your teeth. Nothing bad happens if you cook it too long. It's easier to eat, that's all. Thank you sooo much! I have always wondered *exactly how to eat one of these. p.s. a little mayo thinned with lemon juice is my favorite artichoke dipping sauce. Lyn! I have looked for illustrated instructions online several times to prepare artichokes and always ended up with a mess of leaves and nothing to eat. I'm vegan and have always wanted to try fresh artichoke. This is the most clear, straightforward guide I've ever seen. Thank you! I put mine up side down in the pan to cook. I am not sure WHY I was taught to do it this way, and it might not make a difference, but I thought I would mention it. 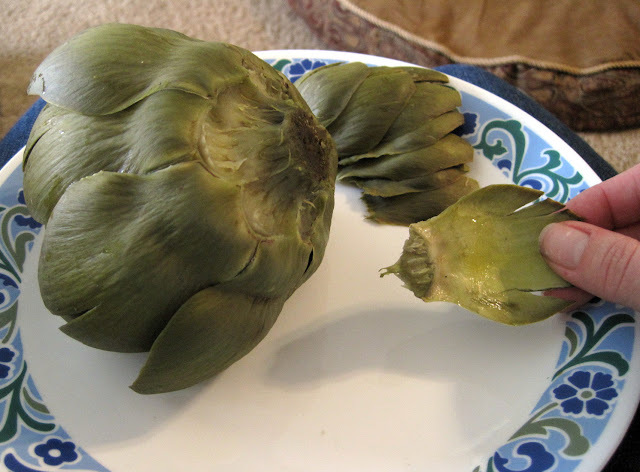 Wow, an interesting, but maybe complicated, way of eating an artichoke! I've never seen them eaten like that. I live in Italy where artichokes are eaten everywhere and by everyone and they get completely cleanded BEFORE cooking them so that you can eat all of them once they're cooked. You take out the "fuzz" and all the hard and darker outer leaves. 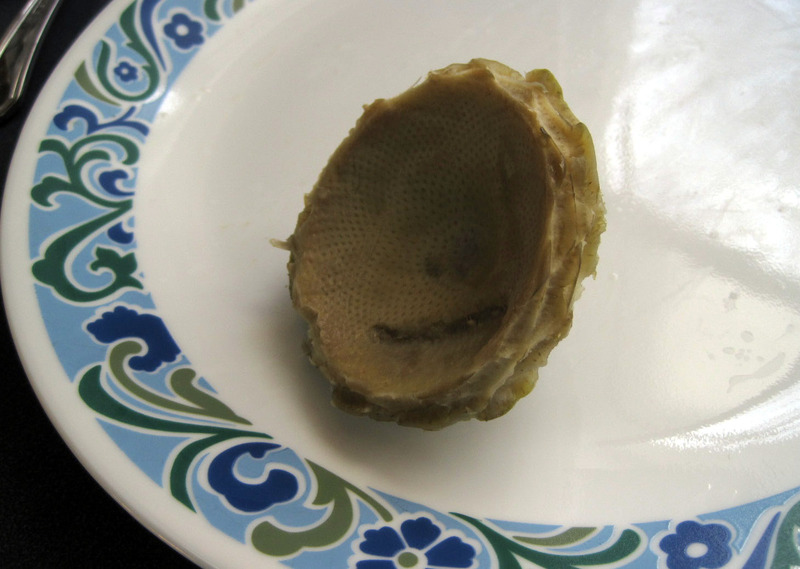 You might want to use gloves since artichokes can stain your hands (when they're raw). If you clean more of them before cookign them you can put them into a bowl with lemon and water so that they don't darken. They are often cooked with a lot of oil and some water (delicious!) You can also slice them and cook with just a little bit oil, garlic and water (+white wine) and eat them in an omelette, with pasta, make a risotto etc. I would love to try that. 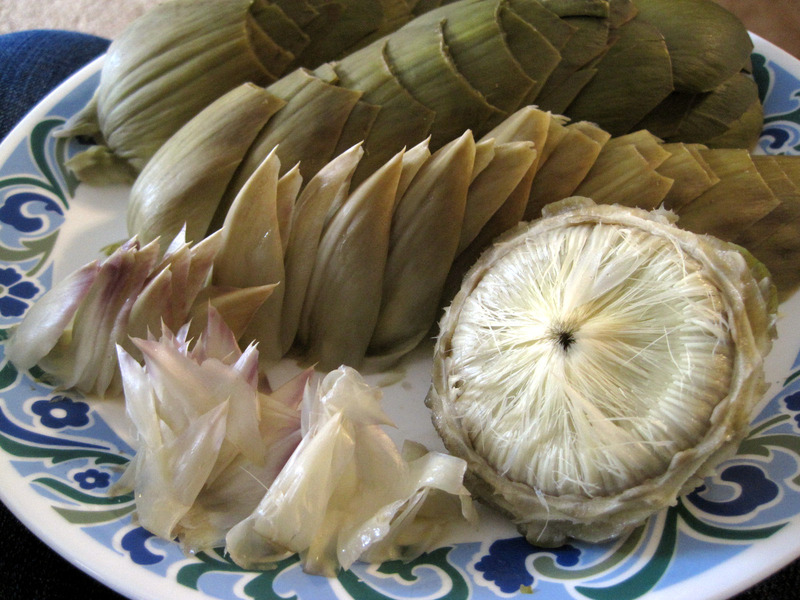 I think you have a different kind/cultivar of artichokes there though; in the US we mainly have Globe artichokes. God bless you- you won't be sorry!